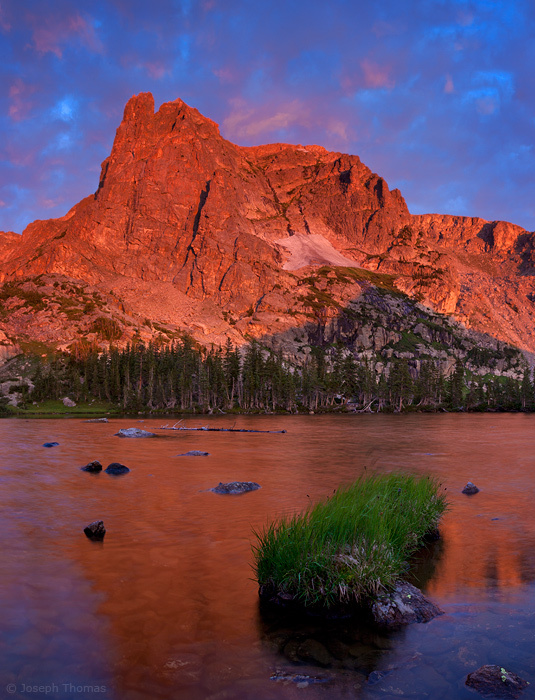 Notchtop Mountain catches morning alpenglow and shines it down on Lake Helene in Rocky Mountain National Park. The conical shadow of Joe Mills Mountain can be seen at center right. Getting this shot involved three 9-mile round trip hikes to Lake Helene. The first hike was taken during daylight hours to scout a composition and to familiarize myself with the trail. The next day I left the trailhead at 3am to get back to the lake in time for sunrise. Ten minutes before the sun came up, the clouds were as spectacular as what you see here. Unfortunately, a sudden west wind blew them all to the east, leaving me with a featureless blue sky. Undaunted, I returned a week later hoping for better luck. This time the clouds remained as the sun ascended over the horizon, giving me a gift of magnificent light that surpassed my wildest hopes!